Depending of the users rights, there is a button at the top. This button appears when the visitor has the right to create top-level albums. There is also the button at the top. 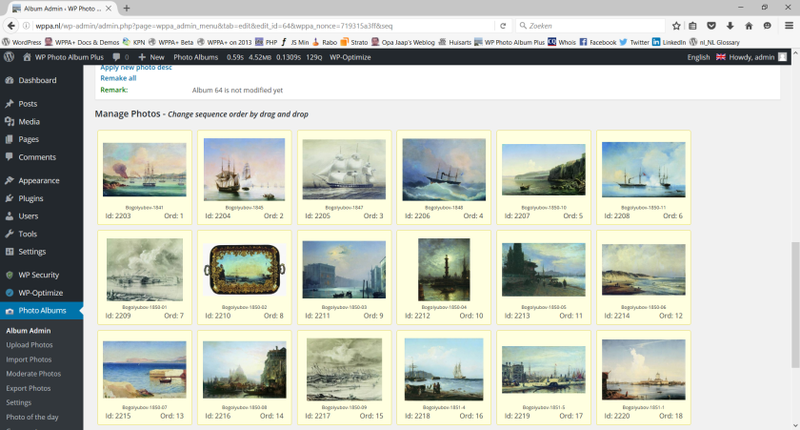 Click on it (on your own site...) and you will see a hierarchical display of albums and sub-albums. The little arrows in the front open/close the list of subalbums (if any). 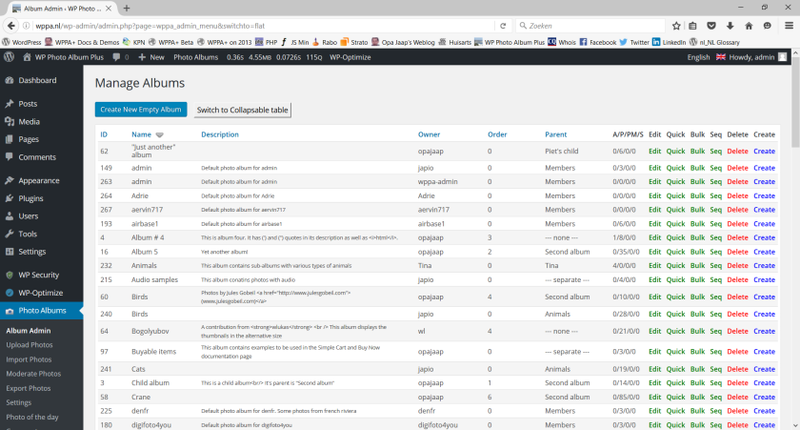 On both versions you can sort the table by cicking on the blue caption titles. If the global album sort order is set to Order# or Order# Desc in Table IV-D1, you will see a list of the top-level albums below the Albums table. You can change the display sequence order by drag and drop the mini covers to their desired location. They will get sequence numbers assigned automaticly. The album table shows various data of the albums, like their id, name, description, etc., and some green links to various Edit methods. If the user has the right to delete the album, there is a red Delete link. 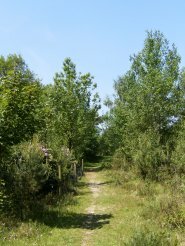 If the user has the right to create subalbums, there is a blue Create link. 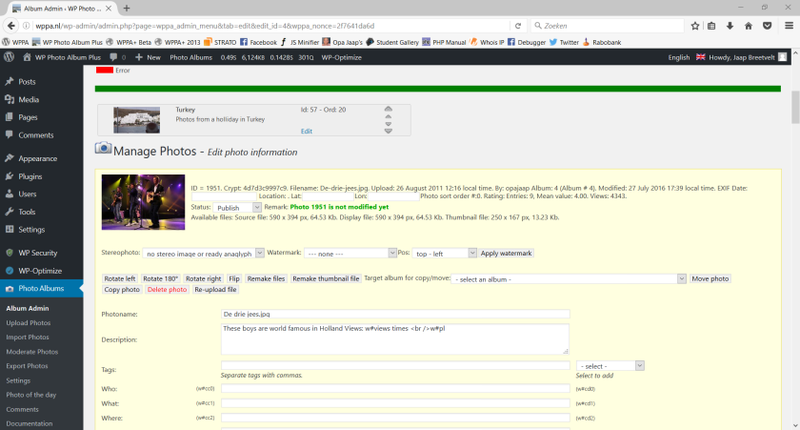 Note: Be careful with giving the right to Album Admin (Table VII-A, 1st column). Users with Album Admin rights will be able to edit and delete photos at the front-end! On the Edit Album Information screen, you can edit all album specific data, like Name, description, parent, etc. Two settings are of special interest: Photo order and Sub album sort order. Both these settings can overrule for this particular album the system defaults as defined in the Settings page. If you set these sort order settings to Order #, (or when the defaults are set to Order#) you can arrange the sequene by drag and drop. 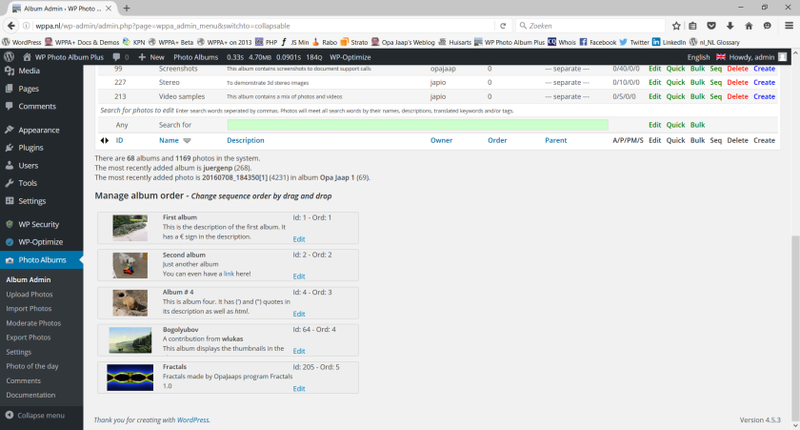 The sub-albums show up between the Edit Album Information screen and the photos; the photos can be drag-drop sorted on the Seq edit screen, see further on this page. 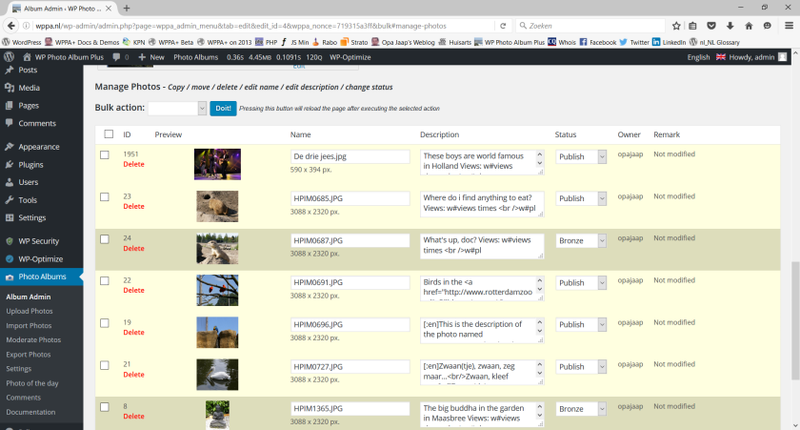 The Quick version is the same as the Edit version, except that page creationtime consuming items are left out. Handy for very large systems (over 1000 albums). This edit screen enables you to quickly change a photo item for a number of photos in one go. Especially helpfull for copying or moving photos to other albums, changing status or deleting. Name and description can also be edited individually. This edit screen enables you to drag-drop the photos to the desired position in the display sequence. 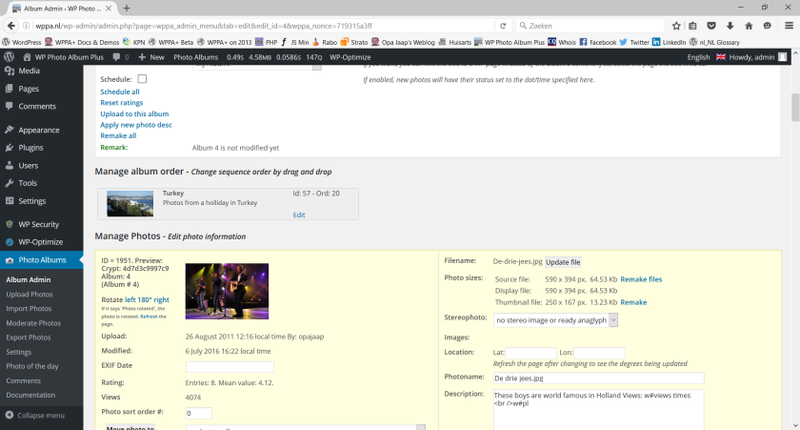 Make sure the photo sort order is either globally or on the Edit Album information screen set to Order# or Order# Desc. Note: You should reload the page after changing sequence to Order# or Order# Desc.